Danny Vega born and raised in Georgetown, TX moved to San Antonio to further his education and exposure in the health industry. 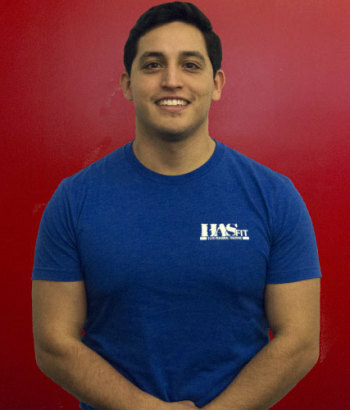 Danny has 5 years experience in the fitness and wellness world. He spent over 3 years working in physical therapy at TexPTS along side board certified doctors and some of the best physical therapist in Texas. Danny is very well rounded in having worked with patients ranged from bariatric weight loss, high school and professional athletes all the way to adolescents. Certified through NASM, Danny is pursuing his Performance Enhancement Specialization. He has dreams of completing school and continuing his education to one day become a Doctor of Physical Therapy. Danny’s passion is improving quality of life in the people around him and creating healthy life styles that are contagious to others.